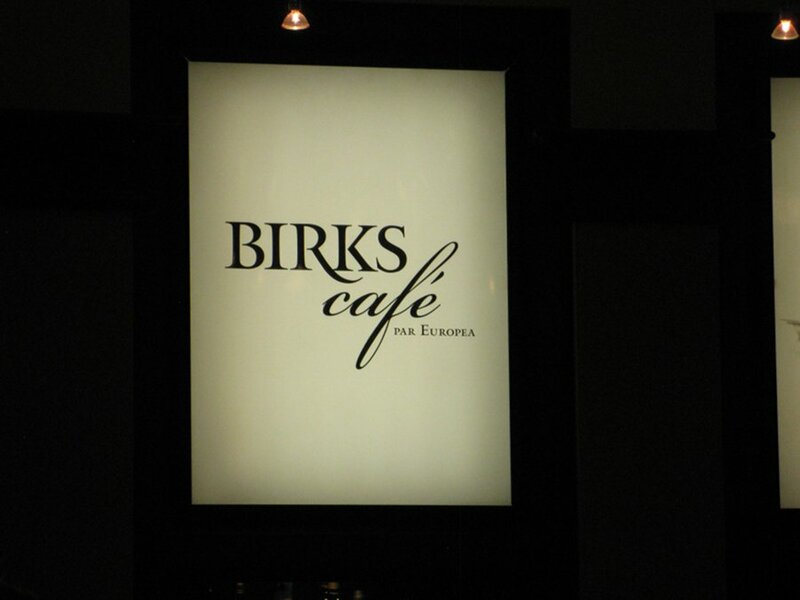 If you have ever been inside or outside Birks you know the décor is nothing short of impressive. The attention to detail is impressive where both the exterior and interior are enormous and almost daunting. When you walk in you need to go to the second floor and you will find a seating area and a bar. A host will greet you and make sure you check your reservations as we had our Montrealbreakfastreview.com staff party here (yes we have staff) and we needed to book a week in advance. The brunch is a fixed menu at $39.50 a head and $19.50 for kids. With prices like these, it makes for a more special occasion brunch since it is more than double a normal brunch. In the end, the taste and price did not disappoint. 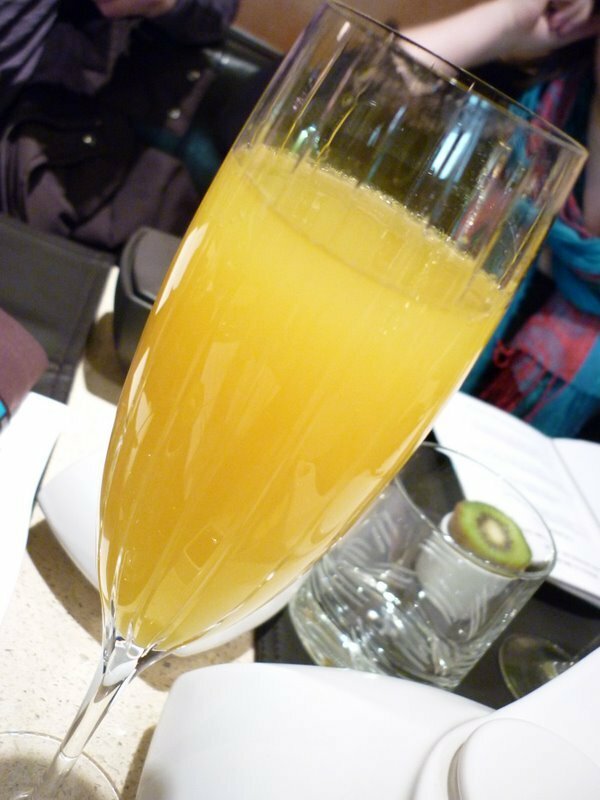 For a little under $40 you get bottomless coffee, orange juice and wait for it……… mimosas . Yup, that right’s, if you want to booze it up in the morning then this place is for you. It’s all you can drink mimosas (NO LONGER BEING OFFERED). In fact, it’s cool when you are sitting to eat and you hear bottles popping in the background. Our editor was a really big fan of this (she may edit this out since she has full control over what I write). Once you get over the awesomeness of the beverages with free refills, you can begin with the menu. 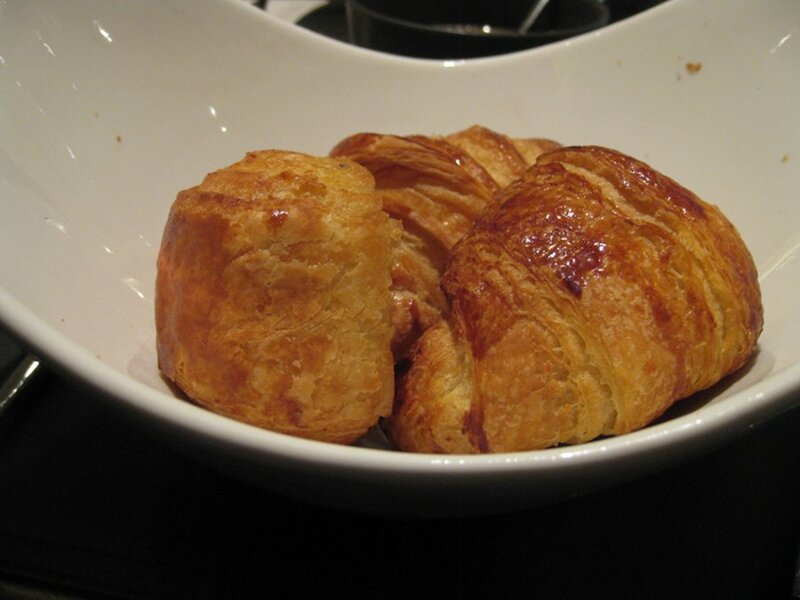 There is a great selection of viennoiseries, breads, and brioches with home made jam. These are a nice treat and the bread is very tasty and so lovely. I’m actually curious what kind of bread it is since it had few crumbs and it tasted so light and yummy. 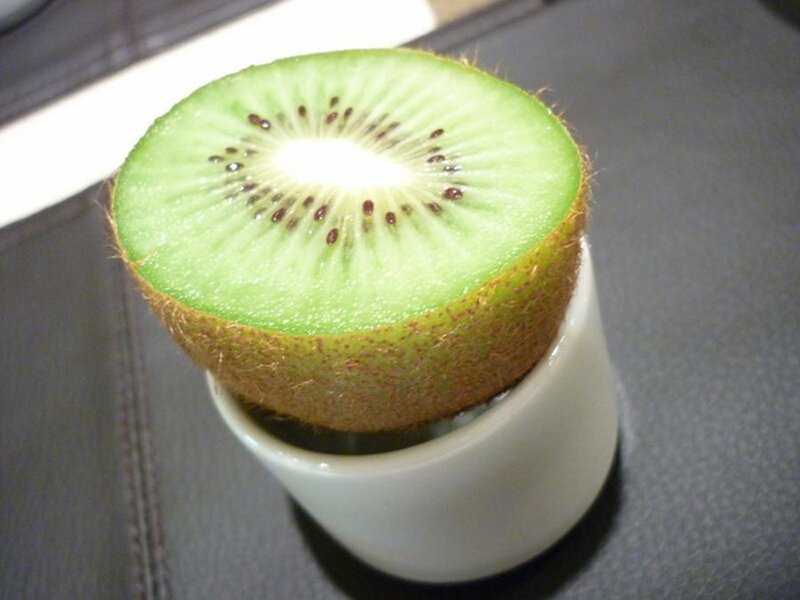 They will also bring a sliced kiwi which you can dig out with your spoon. , I felt it was kind of weird and not needed but hey, I paid for it so I will eat it. They opened up with a teaser that was a prune wrapped in bacon. This was a nice item to choose. I would never consider it a brunch item and in fact, it is more of a tapas dish but it worked so nicely together. It was nice and sweet while not being a sugar overload and the bacon was not overpowering the prune. I know this sounds weird but it’s definitely worth trying. 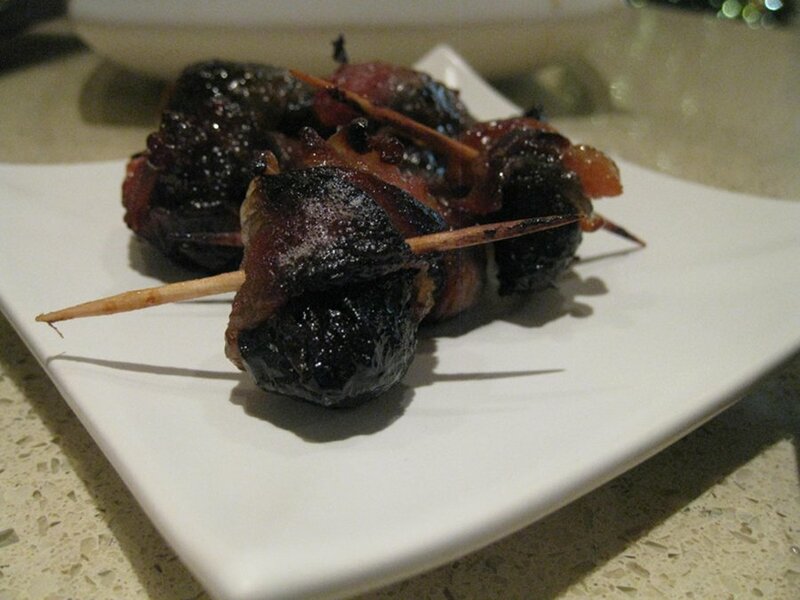 The bacon wrapped prunes are bite sized so you can pop them in your mouth. 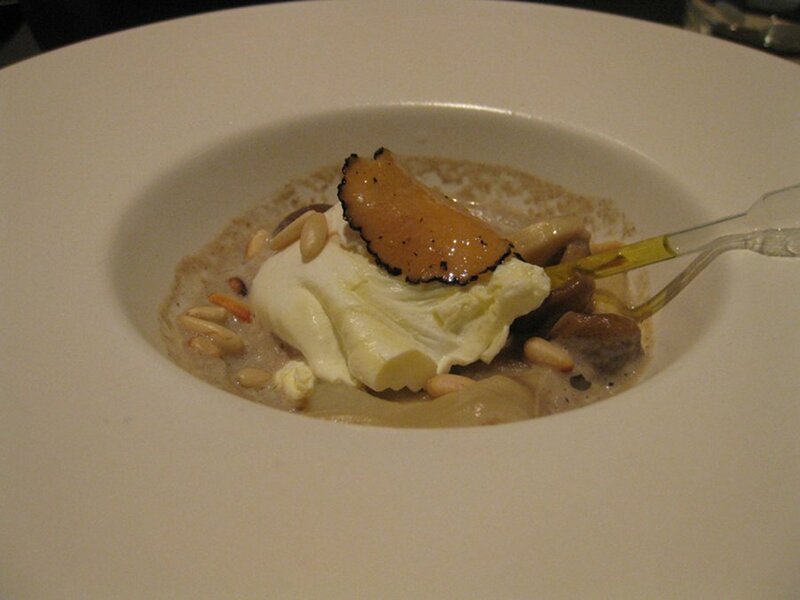 Next came the Poached egg, cheese and pine nuts ravioli with Porcini mushrooms emulsion and truffle oil. The truffle oil came in a plastic applicator where you squeeze it and apply the desired amount of truffle oil. Although cool, I did not notice a big difference. The dish itself is quite impressive with the egg being wonderfully poached and the mushrooms worked well with the egg and nuts. 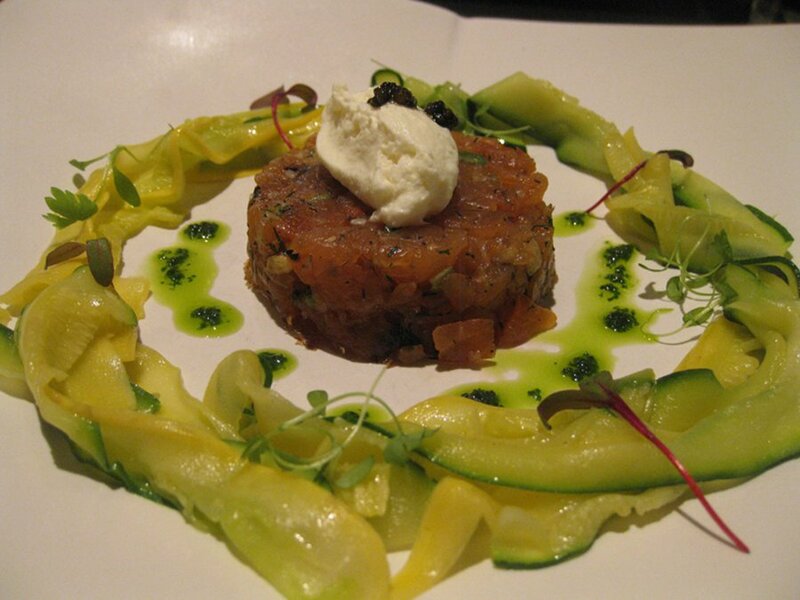 The following dish was Smoked salmon tarta and Abitibi Témiscamingue caviar with lemon flavoured zucchini lasagna. I should note that this is not a lasagna like we know it. My lasagna’s are giant pieces of pasta with meat between them. This, on the other hand, is slices of zucchini put in a nice arrangement on the plate. The smoked salmon tartare made me very happy since I am a huge smoked salmon fan. If you are not then you may not like this, but if you are then you are in for a treat. The tartare was a taste explosion in your mouth and the zucchini tasted great and looked great. Finally, the dessert was a single crepe suzette with orange slivers on top. Although a thin single slice, it was very tasty and delicate; a truly wonderful way to end a brunch experience. 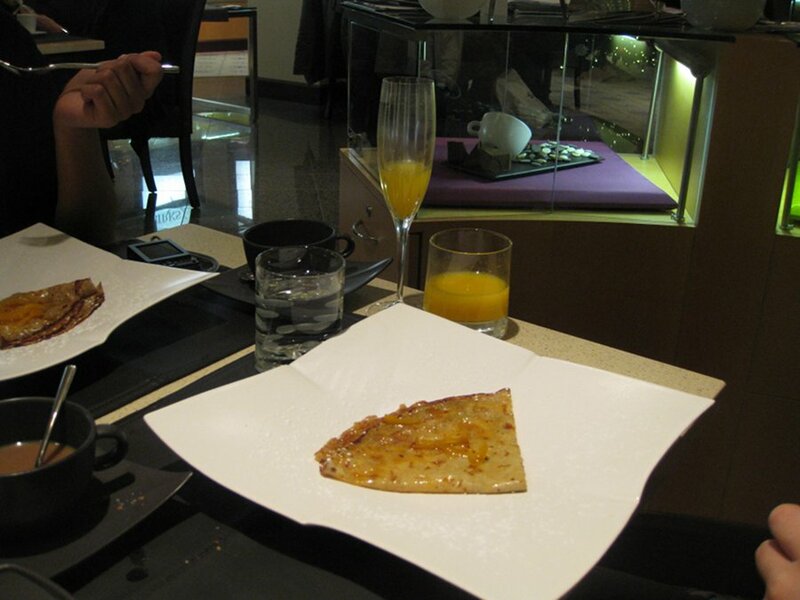 The dish had a nice orange zest to it and the crepe was nice and thin with a little stuffing inside it. The big question is: is it worth dropping $40 a head for this? Well the answer depends on if you like the food on the menu. If this is your kind of brunch then just by adding up all the items on the menu and the free refills you do definitely get your money’s worth. But, if you like bacon and eggs style brunch then you will not enjoy this. 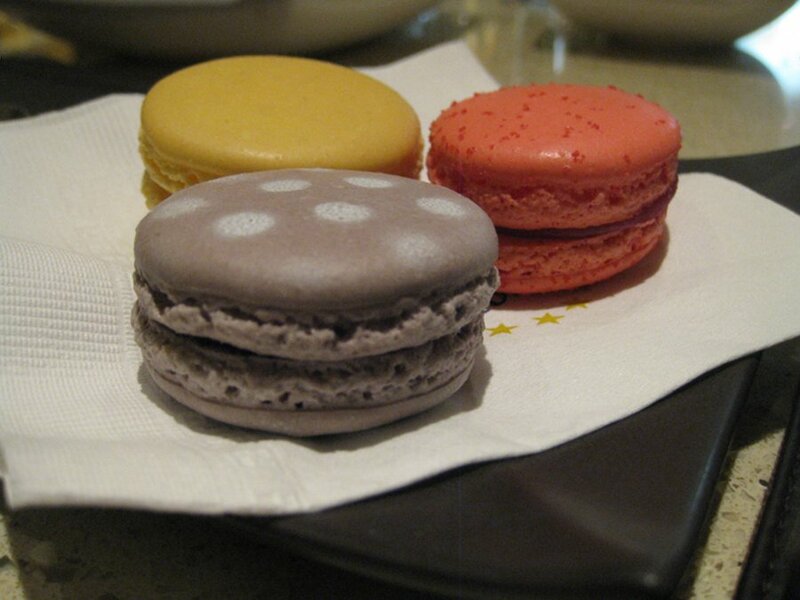 The service was great and our waitress checked up on us very frequently. She refilled our drinks very often, and was great in all aspects of service. 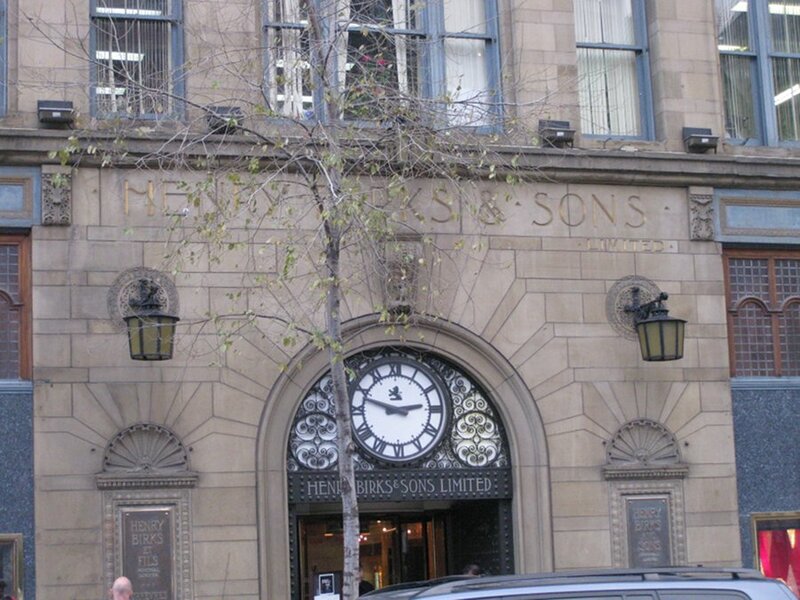 I was very impressed with that and it added to our experience. Her accent seemed also like a proper French accent so it felt even fancier if possible. There is not much vegetarian stuff here. If you don’t mind fish then you are ok but if you are looking for a healthy cream cheese, poached egg and fruit dish you will not find it here. The fact that the menu is fixed makes it more difficult. If you like a fancier kind of brunch and don’t mind spending a little under $40 before taxes, then this is a great spot. You can get your moneys worth and if you like mimosas, you can really get your moneys worth and start the day on the right foot (just watch those steps if you have a couple too many). If you like a more classic brunch then this is not the place for you. 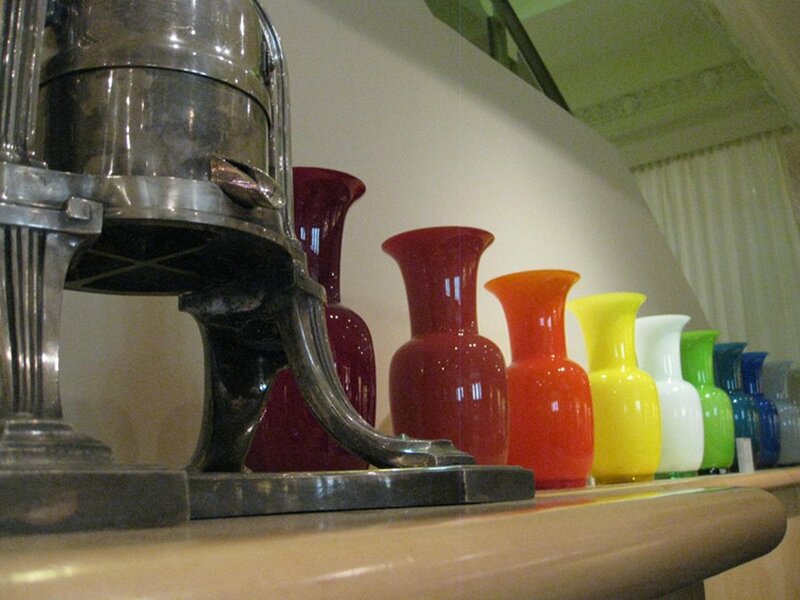 The décor makes it perfect for a special occasion such as family event with a few people or a Sunday date. I would not suggest enormous groups since space is limited. I also suggest making reservations well in advance as this place gets booked quickly. je trouve tres regrettable que vote site ne soit bilingue .Nous habitons pourtant une province majoritairement francaise et supposement bilingue. il y a un petit site en francais mais peu de renseignement.